In his ground-breaking work on the human mind, psychologist Sigmund Freud taught that by delving deep into your past life you could learn how your early childhood experiences created the person you are today. While much of Freud’s work is no longer accepted, it is now assumed by many that what you are as a person today is largely a product of your past experiences. Are you the hard-working, responsible type? That is because you are an oldest child, and the oldest child is often given more responsibilities and more discipline and the expectations are higher; therefore, they turn out to be more responsible. Are you likable but irresponsible, always trying to be funny? That might be because you are the youngest in the family and you decided at an early age you had to act up if you wanted to get a little of the attention. Are you fussy, neat as a pin, quick to go after even the smallest piece of dust? Well, that’s because that’s how it was in your home, and to this day you can’t stand a mess. Or, on the other hand, it could be because you were raised in a messy and unorganized house, and your neatness now is a reaction against how you were raised. Either way, and in many other ways, this can be made to work, and whatever you are can be explained by how you were raised and other past experiences. That, anyway, is the theory. We are a product of our past. While we know our minds are too complex to be explained by any one theory, we certainly do understand the importance of our past and the way we were raised. After all, isn’t that the hope of all parents, that they do the right thing and raise their children in a proper way, so that they can have some positive influence on their children’s adult life? As every parent knows, kids will go their own way, and there is no way you can perfectly pre-program the desired results; but we do have some influence. Even so, parents can control only a part of what a growing child experiences. And, no matter what experiences any one has, there is also, always the matter of one’s own God-given free will. Certainly, your past is an important part of who you are, but it is by no means the only part. But another big part of what goes into making you who you are is your future. This isn’t thought about as much, but we may, in fact, be shaped more by our future than by our past. Let me illustrate how this happens. Brothers Peyton and Eli Manning are great NFL quarterbacks. Their past probably had something to do with this, being the sons of a professional quarterback Archie Manning. The Mannings were a sports minded family, always playing something out in the yard, and the boys learned much from their father. Eli says that their father encouraged them, played with them, and taught them, but he did not force them to play any sports at any level. The boys were allowed to make their own choices about school activities and future plans. Did they want to pursue this interest in football as encouraged by her father, or, would there be other interests that they would want to pursue? Children don’t always move into something just because their parents are encouraging it. I went to school with several farm boys. Some wanted nothing more than to get done with school and go farming. Others, couldn’t wait to graduate, go to college, get into some other kind of work, and never again have to look at another cow, pig, chicken, or bale of hay. The Manning boys chose to keep playing football, and somewhere along the line, after making that choice, the future began to be a more important influence than the past. No longer were just playing football in the back yard because that is what their dad liked to do. Eventually, they were playing football because out ahead in their future, they could see themselves in the NFL, just like their dad. That future hope began then to shape and determine everything they did and every decision they would make– how to spend their free time, where to go to college, who to have as friends, what to eat, how to exercise, and everything else. Their past experiences shaped them, but now, their future hopes were determining much of what they did. In their past they were exposed to football and developed a love for it. But it was the future hope of a career in football that turned the game into something more than the leisure-time activity that it is for most people. Philippians 3:12-14 — Not that I have already obtained this or have already reached the goal; but I press on to make it my own, because Christ Jesus has made me his own. Beloved, I do not consider that I have made it my own; but this one thing I do: forgetting what lies behind and straining forward to what lies ahead, I press on toward the goal for the prize of the heavenly call of God in Christ Jesus. O Jesus, fill me with your love, and I pray, and use me a little for your glory. I pray that you accept me and my service. Amen. There is much in the Bible that tells us what to do: be honest, be faithful, love and serve your neighbor, do not lie, do not cheat, do not steal, and so forth. One of the best known parts of the Bible is the Ten Commandments, that very important list of things that we should do, or, not do. There is indeed much in the Bible about what we should do. But there is probably even more in the Bible about what we should see. For example, II Corinthians 5:16 tells us we should no longer see other people from a worldly point of view. For another example, the world says, “You can have it all;” but God in the book of Proverbs says, “It is better to have only a little and have peace, than to have great wealth and nothing but strife” (Proverbs 17:1). From a worldly point of view, when you get old and your health is gone, you are done for. But from God’s point of view, even at the end of our days we can say with Paul, “Brothers and sisters, our salvation is nearer now than when we first believed” (Romans 13:11). I Samuel 16:7 tells us that even though from a worldly point of view people are judged by their outward appearances, God looks at what is in the heart; again, a different way of seeing. From a worldly point of view, the time comes for us all when our time is up and as the old expression goes, “We haven’t got a prayer.” But with God, no matter how hopeless the situation looks one always has a prayer. Jesus, beaten and hanging on the cross, with the life quickly draining out of him, still had a prayer. He prayed, “Father, into thy hands I commend my spirit” (Luke 23:46). The Bible tells us all kinds of things to do, but first of all, it tells us how to SEE– how to see the world, and life and death, and other people, and everything from a whole different point of view. And then, with that whole new way of seeing, we are led into the wisdom to obey in those things God has told us to do. Many years ago, Howard Thurman was the dean of the chapel at Boston University. He was the grandson of a slave and often told stories that he had heard from his grandmother about living in slavery. One of the things she told him was the importance of the slaves of going to church on Sunday. Decades later, she could still remember well how her old slave preacher would so powerfully tell the story of Jesus resurrection from the dead, and then describe the promise of how we too would live forever with him in heaven. And then the old preacher would take off his glasses, look straight into the eyes of the congregation, lean over the pulpit, and say to them in all seriousness, “Slaves, I want you to remember, you are not any man’s property. You are the children of God Almighty, and no one can ever take that from you. Never forget that.” Sunday after Sunday, he was preaching into those people another point of view– not the worldly point of view, but God’s vision; and in their desperate and sad situation, that made all the difference. With that new way of seeing they could live and die with hope and courage. Even in the deepest and darkest valley, we can know God is with us, and that gives us an entirely different way of seeing everything. Habakkuk 3:17-18 — Though the fig tree does not bud and there are no grapes on the vines, though the olive crop fails and the fields produce no food, though there are no sheep in the pen and no cattle in the stalls, yet I will rejoice in the Lord, I will be joyful in God my Savior. –From The Valley of Vision, 1975, a collection of prayers by the Puritans edited by Arthur Bennett. In the rest of the story Jesus explained to them from the Scriptures the meaning of those events. Then, at just the right moment, the Bible says their eyes were opened, and they recognized Jesus, their friend, back from the dead (verse 31). And suddenly, Jesus disappeared, and the two men ran back to Jerusalem to tell the others. In verse twenty-one the men said: “They crucified Jesus, but we had hoped that he was the one who was going to redeem Israel.” We had hoped. That is a very sad little phrase. Hope there is in the past tense. Hope is a wonderful thing, but in order for hope to work, it has to be in the future tense; you have to be hoping for something yet to come. But here, hope is in the past tense. So this sad little phrase is really not talking about hope at all, rather, it is talking about the DEATH of a hope. “We had hoped he was the one,” they said; but “they crucified him,” and now he was dead, so now, there is no hope. We have to have hope to live. We can be in the most desperate and miserable of situations, but if we have hope, we can go on. Prisoners of war, living under horrible conditions, tell how they were able to survive because they kept hope alive. On the other hand, many survivors report that those who lost hope, would die. We must have hope. So it is a depressing little phrase that says, we HAD hoped he was the one. Perhaps you know the feeling. I had hoped, she said, that he’d give up drinking after we got married, but he didn’t and now my life is ruined… I had hoped, he said, that the treatments were going to work and I would get better, but that didn’t happen and I’m not going to see my kids grow up… I had hoped, she said, that our son would at least call us someday, but we never hear from him… I had hoped, he said, that I could keep my job, but I got laid off, and I’m 55 years old, so now what will I do?… I had hoped, she said, that my prayers would be answered, and he would have returned to me, and I would not be alone. But the praying did no good, so where is God anyway? If this faith thing can’t get me the help I need when I need it, then I’m not interested. 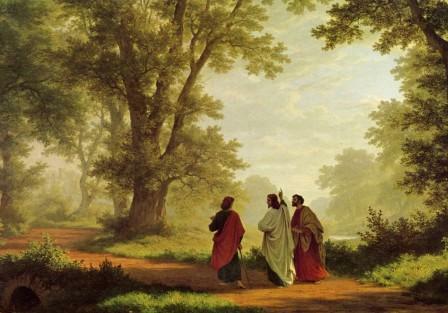 We had hoped that he was the one, said the two disciples on the road to Emmaus. We all know what it is to have hoped for something, and we all know what it is to have those hopes disappointed. And hopes and dreams, even when met, can, after a while, still be disappointed. There are a lot of little boys and girls right now who are just hoping for the time to go fast so Christmas can arrive, with days off from school and presents galore. That hope will be met, the time will go by fast and Christmas will arrive; but so also then will the vacation time go by fast, and the gifts will be opened and stuffed in the closet, and it will be back to school. As we get older and learn how this goes, our hopes deepen and mature, as we have more long term goals and dreams. But still, whatever we hope for, even if achieved, will not last. Even life-time hopes like for a career and marriage and family will come and go like a Christmas vacation. “I had a good life,” said the old lady in the care center; “I got pretty much everything I wanted and worked for, and it was nice, but now it’s over.” Even if we get everything we want, our hopes will still soon be disappointed, because the most basic fact of life is that time runs out. I Corinthians 15:19 says, “If only for this life we have hope in Christ, we are of all people most to be pitied.” We need a deeper hope, a more profound hope, a more long lasting hope than anything we are able to manage on our own. We need a hope that will transcend all of our other hopes. Even if God’s way would be to give us everything we wanted, when we wanted it, we would in the end, says the verse, still be sad and pitiful. Death ends even the very best lives. Romans 5:1-5 — Therefore, since we are justified by faith, we have peace with God through our Lord Jesus Christ, through whom we have obtained access to this grace in which we stand; and we boast in our hope of sharing the glory of God. And not only that, but we also boast in our sufferings, knowing that suffering produces endurance, and endurance produces character, and character produces hope, and this hope does not disappoint us, because God’s love has been poured into our hearts through the Holy Spirit that has been given to us. (…continued) Once you start looking, you will see that little word ‘but’ all over the place in the Bible. It is a good word to remember in all of life. As a person of faith, you will always want to keep putting the BUT in your story. That is what I mean by using your ‘but.’ “Things are not going very well for me right now, BUT I know God is with me.” “Much of what is going on in my life doesn’t seem to make much sense or have much purpose, BUT I know that God has promised to work out all things for my good.” “I am having a bad day/week/year, BUT God has given me so many good days/weeks/years.” “This is a painful time in my life, BUT the Bible says God can teach me and help me to grow in our faith through the painful trials I must endure.” “I’m not yet what I want to be, and I know I’m not yet what God wants me to be, BUT I do know he has forgiven and is working within me.” “I’ve been so ill for such a long time, and I’m getting sick and tired of being sick and tired, BUT I know that God can heal me if that be His will.” Or perhaps, “The doctor just told me there is nothing more they can do for me, BUT God has already given me 61 good years, and I know that even when this life ends, I will go to live with the Lord in a far better home.” By faith, we have to keep remembering to keep these ‘BUTS’ in our story. Faith prays, and faith hopes, but then faith is always able to adjust and go deeper. God always has another promise. God always gets the last word. You have often been told to use your head. I am suggesting also use your ‘but.’ Use it like these Biblical writers for the strengthening of your faith as you remember God’s past faithfulness. Everyone has a story to tell of trouble in their life. And every person of faith can tell a story of how God has brought them through, or, of how God’s future promises sustain them even in the midst of ongoing troubles. Take a moment to consider your own stories of trouble, and how you can make the phrase “BUT GOD” a part of the way you tell the story of your life. We often wonder how we can share our faith with someone else. One of the best ways you can share your faith with another is by just telling them your story, describing what Jesus means to you and how God has made a difference in your life. And somewhere in your story, you can use your ‘but.’ That is what the former slave-trader John Newton was doing when he wrote, “I once was lost, but now am found, was blind but now I see.” You do not have to tell people what they need to do for God. You can simply tell them what God has done for you. Psalm 78:4b — …We will tell the next generation the praiseworthy deeds of the Lord, his power, and the wonders he has done. 1 Peter 3:13-15a — Who is going to harm you if you are eager to do good? But even if you should suffer for what is right, you are blessed. “Do not fear their threats; do not be frightened.” But in your hearts revere Christ as Lord. Always be prepared to give an answer to everyone who asks you to give the reason for the hope that you have. II Corinthians 1:8-10 — We do not want you to be uninformed, brothers and sisters, about the troubles we experienced in the province of Asia. We were under great pressure, far beyond our ability to endure, so that we despaired of life itself. Indeed, we felt we had received the sentence of death. But this happened that we might not rely on ourselves but on God, who raises the dead. He has delivered us from such a deadly peril, and he will deliver us again. On him we have set our hope that he will continue to deliver us. 2 Corinthians 4:6-9 — For God, who said, “Let light shine out of darkness,” made his light shine in our hearts to give us the light of the knowledge of God’s glory displayed in the face of Christ. But we have this treasure in jars of clay to show that this all-surpassing power is from God and not from us. We are hard pressed on every side, but not crushed; perplexed, but not in despair; persecuted, but not abandoned; struck down, but not destroyed. We are all on a journey to God, and on the earthly part of that journey God is with us providing comfort and strength and assurance in the midst of all our troubles. But when the very worst does come, death ends only the earthly part of our journey, and we then continue on in God’s heavenly home. So, Paul says, we will never be separated from God’s love. Sometimes we limit our trust in God to this time and place. We hear things like, “Just trust God, he’ll make sure you get better;” or, “just trust God, he will make sure you get what you are praying for.” But I don’t think Paul would say that. Yes, we must certainly trust God in and for all things. But it is an immature faith that thinks trusting God means that God will always give you everything on your list, as if your will was always perfectly in line with his. God’s will for us may be very different from our own wishes, and a more mature faith will trust in God even when it seems he is not there at all; even when it seems God contradicts our personal preferences. God will, as it says in Romans 8:28, work out all things for the good of those that love him– but we must remember that God has all eternity to work things out, and not just the 70 or 80 years of your life here. Before going into combat a soldier asked the chaplain if his prayers for safety would guarantee that he would not be harmed by bombs or bullets. The chaplain replied that faith in God made a man sure and certain of the most important thing, which is that even if his body was shattered, his soul would be untouched and safe. We know that many soldiers in every war have prayed for protection, but many of them did not make it home. We know that every day many prayers in many hospitals are not answered with health and recovery. But our trust is in a God who is bigger than life itself. Death for God is nothing more than one of the many problems that God will one day put an end to forever. On that day, death itself will die. Romans 8:35, 37 — Who shall separate us from the love of Christ? Shall trouble or hardship or persecution or famine or nakedness or danger or sword?… No, in all these things we are more than conquerors through him who loved us. Romans 14:7-8 — For none of us lives to himself alone and none of us dies to himself alone. If we live, we live to the Lord; and if we die, we die to the Lord. So, whether we live or die, we belong to the Lord. “I remember when I was a very little girl, our house caught on fire. and raced through the burning building out to the pavement. Refrain: Is that all there is? “And when I was 12 years old, my father took me to the circus, the greatest show on earth. There were clowns and elephants and dancing bears and a beautiful lady in pink tights flew high above our heads. And as I sat there watching the marvelous spectacle, I had the feeling that something was missing. “Then I fell in love with the most wonderful boy in the world. And I thought I’d die, but I didn’t. “I know what you must be saying to yourselves. Delta Dawn is another sad song, but unlike Peggy Lee’s 1969 hit, Helen Reddy’s 1973 hit contains a hint of hope– a brief word of hope using an image from the Bible. Delta Dawn what’s that flower you have on? In her younger days, she was a beauty, “the prettiest lady you ever laid eyes on.” Then she was abandoned, stood up by a “mysterious dark haired man” who had “promised her he’d take her for his bride.” Now, “folks around Brownsville say she’s crazy,” because she is still walking around town with her suitcase in her hand, waiting for this mysterious dark haired man. So far, this is just the story of a broken and disturbed woman, and she seems to be without hope. But something else is going on here. Delta Dawn is now waiting for someone to take her where?– “to his mansion in the sky.” Who talked about taking people to a ‘mansion’ in the sky? Jesus, of course, in John 14. Delta Dawn has been hurt in this life, and she’s a wounded soul. She has gone from being the prettiest girl in town, to a crazy lady. She’s “a faded rose from days gone by.” But she still has a hope. Someone else is coming to get her, someone who will not disappoint her, but who will indeed take her to his mansion in the sky. Did Alex Harvey have all that in mind? I don’t know, but that is the image he used. So to answer the despairing question of Peggy Lee “Is that all there is?,” Delta Dawn says “No, there is more– there is a mansion in the sky.” “Believe in me,” said Jesus in the same passage as he talked about that mansion– “Believe in me and I will take you there.” Delta Dawn is a believer and she is ready, suitcase in hand. Ecclesiastes 2:17 — So I hated life, because the work that is done under the sun was grievous to me. All of it is meaningless, a chasing after the wind. Life is a struggle, Paul says in Ephesians 6, and we know what he means. We face struggles with children and with parents, with spouses and bosses, with co-workers, employees, neighbors, and authorities. There are struggles for health, struggles with finances, and struggles against despair, fatigue, and frustration. We know the feeling. To live is to do battle on many fronts. Paul goes right to the center of all these struggles and says that at the very heart of it all, this is a spiritual struggle. It is a struggle to do right and not do wrong; it is a struggle to have faith and hope, and to not give in to despair and unbelief; it is a struggle to know and hang on to the truth of Jesus Christ that transforms everything. The struggle continues, but when you know and believe that truth, you can know that one day the struggle will end and you will still be all right. And knowing that you will be all right in the end can change one’s whole view of the struggle. I have struggled through many snowstorms. I worked my way through college driving milk trucks, garbage trucks, and school buses. And there were many days that we had to be out on the road in the very worst weather. And although I never looked forward to having to drive on bad roads with poor visibility, there was always something exhilarating about getting the work done on days like that. I remember especially the January 1975 ‘Blizzard of the Century’ as it was called in Minnesota. The first day of the storm nothing moved. It was impossible to go anywhere. The next day was only a little better, but we had to get out. Now there were two days milk to pick up, and some farmers were already dumping milk down the drain for lack of room. We had to try and get to the farms. But it was trouble all day. Roads were opened slowly by the plows but then quickly drifted shut again, driveways were plugged, the temperature was 20 below, and the wind was fierce. Sometimes it would take as long to get two farmer’s milk picked up as it would normally take to pick up at all eight farms of an entire load. Getting stuck meant hard shoveling in 70 below wind chill. Everything was frozen and more difficult. But we got the work done. We got all the milk to the creamery that day in the ‘Blizzard of the Century.’ There was something very satisfying about that, and looking back on it now, I remember it as a good day. I remember another storm, this one a few years later while I was a student pastor in South Dakota. This storm I do not remember so fondly. I got caught in this storm late at night on a seldom traveled road that I was not familiar with. There were few farm homes in that area, and in the blowing snow I could see not a single yard light in any direction. I could not risk leaving my car. It was far too cold, and I had no idea which way to go or how far I would have to walk. But it was also dangerous to stay with the car. I was stuck in a huge drift in the middle of the road on a curve. With the poor visibility, I feared getting hit by another car or a snowplow. After two hours of shoveling and praying that no other vehicles would be on the road, I did get out and made it the rest of the way home safely. But that experience was not exhilarating. It was just plain frightening. What was the difference? In the first example, I knew I was going to make it. It was cold and miserable and the snow was often deep. But it was daylight, visibility was adequate, I knew the area, and there was always a farm in sight and within walking distance. Even though I still had to struggle against the elements and suffer the cold, I knew that I was going to get home safe. I would not freeze to death or get hit by a snowplow that could not see me. It was still a difficult struggle all through the day, but I was without fear. In the South Dakota storm, the struggle was filled with uncertainty and fear. For three hours I did not know whether or not I would live or die. Leaving my car would put me in a life-threatening situation, but it was also dangerous to wait inside my vehicle, or, to be outside shoveling. Anything I chose to do put me at risk, the outcome was unknown, and I had much to fear. To those who believe in Jesus Christ as their Lord and Savior, the Gospel says, ‘You are going to make it!’ No matter how tough it gets, no matter how fierce the battle, no matter how miserable the path, no matter how long the struggle, you are going to make it to God’s home safely. Not even death can change that. “Whether we live or whether we die, we are the Lord’s,” says Romans 14:8. We can be assured of that. The struggle will continue but the outcome is certain. Jesus has won the battle for us and so we can live without fear. Therefore, the struggle can be exhilarating and satisfying, like the day was for me hauling milk in that snowstorm. We do not have to be crippled by fear, like I was on that remote South Dakota highway. This can make all the difference for us. We can live with courage and confidence, come what may, for God is with us in all things and at all times. Jesus Christ has defeated death, has gone on ahead of us, and he has promised to bring us to himself. Ephesians 6:11-12 — Put on the full armor of God so that you can take your stand against the devil’s schemes. For our struggle is not against flesh and blood, but against the rulers, against the authorities, against the powers of this dark world and against the spiritual forces of evil in the heavenly realms.